We provide bespoke musical arrangements for wedding ceremonies and receptions. Following an email chat where we discuss your musical taste and wedding plans, we will work with you to create an intimate and personal version of your song. We can also provide intimate live-lounge sets of up to 2 hours of music over drinks or dinner for any wedding, special occasion or event. 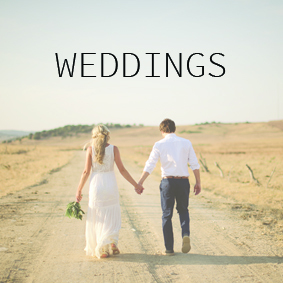 You can pick any song from our eclectic and extensive playlist and we'll play it for you while you relax with a drink after the Ceremony or during your Wedding Breakfast. We can DJ for your evening party making sure the dancefloor is packed all night long! We will take all your requests creating a bespoke DJ setlist and of course can take requests on the night too. We can provide music for your whole wedding in one easy-to-book package! The Asylum Chapel, Trinity Buoy Wharf, Casa La Siesta - Vejer, Cripp's Barn, West Mill Darley Abbey, Gaynes Park, Wasing Park, Blenheim Palace, Notley Farm, Aynhoe Park, Kingscote Barn, Gate Street Barn, Long Furlong Barn, Lulworth Castle, Fitzleroi Barn, Foxhill Manor, Matara Centre, Hare and Hounds Hotel, Layer Marney Tower, Hampton Court Palace, Pembroke Lodge.